How long did it take you to build your tiny house? Our tiny house took 10 months to build. How big is your tiny house? 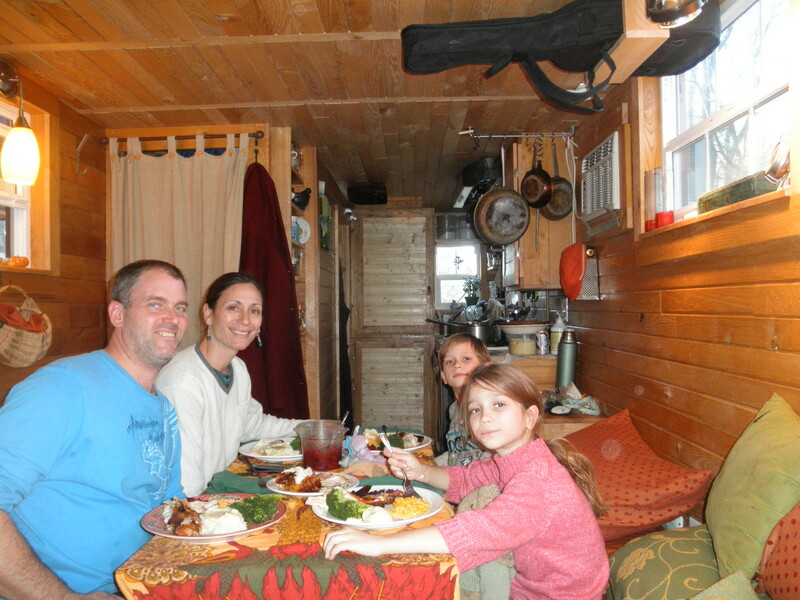 The foundation of our tiny house is an 8′ x 21′ flatbed trailer, so the footprint is 168 sq. ft. Add to that two separate sleeping lofts. Was it difficult to adapt to a much smaller house? Why? Yes. At first we had to adapt physically. We bumped our bodies a lot—tossing at night and I bumped my head on the ceiling in the loft and on the sink in the bathroom. We bumped into each other. We spent a couple of years preparing to move into the tiny house, so the downsizing process was quite long. We held yard sales and donated lots of our things. Then there’s the emotional adapting which is ongoing for us. With four of us in this tiny space, our emotions can fill it up quickly. We’ve learned some techniques, we’re still learning, actually—we’ll never be done learning how to communicate. It’s important for us to express when we need space, help, when we’re sad, angry, etc. If we don’t clearly communicate our feelings, they can overwhelm us in this tiny space. Do you ever miss some of your old stuff because it won’t fit in the tiny house? What do you miss? I have always missed a bathtub. If I built the tiny house again, I would include a tub. When we consult with others, I make sure to share my feelings about including a bathtub in the design. I also miss our couch. We had a big comfy couch on which we could all lounge comfortably together. We sold it before we moved. It would take up our entire living space in the tiny house. Can you give me some examples of what you do to not accumulate a lot of stuff? We are heavy users of the library. We read and return. There’s no accumulation there, and it’s free. The library is one of our favorite places. A side-benefit of going to the library is we all get some space. It’s like our living room in town. We go through our clothes a lot—if the item isn’t getting worn or the kids have outgrown it, we pass it to a friend or give it to the thrift store. If the item is worn out, I cut it into napkin sized squares, and use the squares for dining. I’ve also re-purposed clothes into bags, scarves, potholders, and prayer flags. We do a daily purge. Everything has to be in its place before bedtime. That means if there isn’t a place for it, it has to go. We don’t shop for fun. We only shop when we have a real need. We can food from our garden and buy dry goods like beans and rice in bulk at our local food co-op. This limits our consumption of packaging, which is a space hog. Keeping food in canisters and jars makes it easy to see what needs replenishing—this way we avoid duplicate items. Can you give me some examples of what you do to maximize the space? Where do you put all of your stuff? We designed our tiny house after closely studying the traffic patterns in our daily lives. We accommodated every activity in our former house the best we could. Our tiny house has a foyer with a shoe bench. We keep all of our shoes inside the bench. It’s storage and also a place to sit and take-off or put-on shoes. We use shallow shelving for our stuff. This helps us to see what we have and not lose track of hidden items in the back of a cupboard or deeper shelf. We each have a cabinet for our clothing, and a junk-drawer for our papers and other treasures. The couch lifts up for storage underneath. We use lots of hooks which are quite helpful for a quick place to get something like a backpack or coat off the floor. We hang our dining chairs on the wall and the tables fold up and lean against the wall. Is it difficult to live with two kids in such a tiny place? When the weather is nice, it doesn’t even feel like we live tiny—the living is easy. It is hard in the dead of winter, though. Now that the kids are getting bigger, we’re more crowded, and the kids’ need for privacy is becoming more clear. They are loud which is difficult when I’m trying to write or focus in any way. They bring stuff home everyday—and they don’t always keep it where it goes, so we have to stay on top of it constantly. Then there is the privacy as a couple issue. We do have to be creative about finding time as a couple. How do you find private time as a couple? We have separate lofts, the kids aren’t always home, and they sleep. Do you have any idea how much money you save, per month, by living in a tiny house? We saved my salary when we were both working outside the home. Now Karl is working full-time on building our bigger house, so we are living on my salary and using anything extra to build our mortgage-free bigger house. Because we live without a mortgage, we save at least $1000/month just by living in the tiny house. 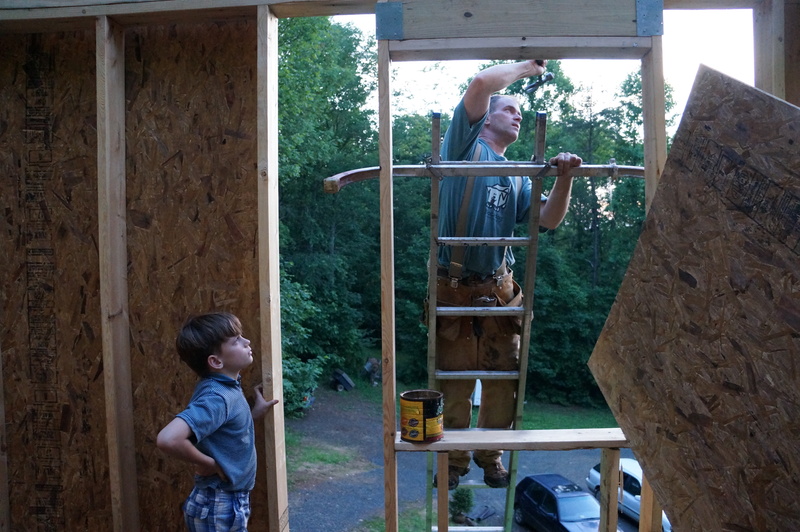 Building the tiny house made it possible for us to start living our mortgage-free dream quickly, so that we could continue saving to build our right-sized house. And how much do you spend in gas, electricity and water, when compared to the bills you had in your former house? Is it a big difference? It takes very little to heat the tiny house, so the electricity bill is about a quarter of what it was in our last house. We have well-water and septic, so we don’t have any utility costs except electric. In your opinion, what is the biggest inconvenience of living in a tiny house? The biggest inconvenience of living in a tiny house is not having a space for our creative work. We each need and want a little room of our own to write, paint, make music, sew, etc. The biggest joy is that we’ve made it work. This tiny space seemed impossible to turn into a home, but this really is home and has been for 3 and a half years. It’s taught us so much about what we value. Oh yeah, and we’re mortgage-free! Are the tiny houses the houses of the future? Why? Tiny houses are a great way for folks to live in dignity and to gain freedom from the system that keeps us trapped in debt and consumption. I think more and more people are rethinking what home means, designing a home to meet personal needs, and not trying to fit into a home that was mass-produced. I think we need to be careful when talking about tiny, though. It’s not so much about how many square feet we have, and having the tiniest house, but how we use and live in the space. It’s about right-sizing our homes, and living comfortably within our means. 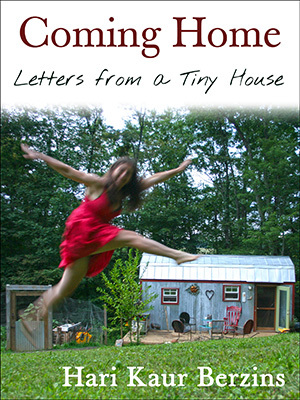 For us, the experience of living tiny has informed our lifestyle, and we are forever shaped by it. As we finish and move into our bigger house, we will carry this lifestyle into a bit more space. Living tiny means we live fully in our space and use it to it’s fullest capacity. It doesn’t mean you have to live in 168 sq. ft. Heck, I know living in this space wouldn’t be the best for us long-term. The kids are nearing adolescence and I don’t expect them to share a tiny loft as teenagers. Because we’ve lived tiny, we know exactly what we miss, and our bigger house will be perfect. We will each have a small room, we will have a bathtub, a dining area, and living area where we can have a nice party. The space will be right for us. * Above interview by Mariana Pinheiro, journalist. You are building a big house. How log have you been building that? We broke ground on the big house in October 2012. How big is the big house? Can I buy plans for your tiny house? How about for your big house? 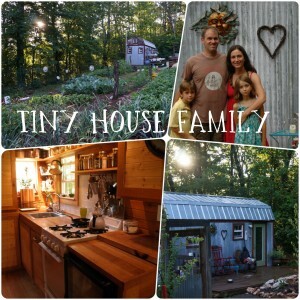 What will you do with your tiny house once you move into your big house? It will become a micro bed and breakfast, guest house, teaching tool, and who knows what else. Still have a question? Send us an email here. Thanks for reading!